We are the members of the Parish of Richmond of the Diocese of Fredericton, of the Anglican Church of Canada, who gather to worship God and hear His word at St. Mark's Church in Jackson Falls, at St. John's Church in Richmond Corner and at Holy Trinity Church in Hartland, New Brunswick. CLICK HERE TO READ OUR WEEKLY E-NEWS! We are a three point charge located in a vibrant rural area of New Brunswick, Canada. By God’s grace, building a loving & caring community wherever we are. 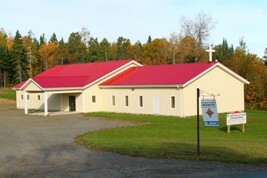 We, the people of the Parish of Richmond of the Diocese of Fredericton, of the Anglican Church of Canada, who gather to worship God and hear His word at St. Mark's Church in Jackson Falls, at St. John's Church in Richmond Corner and at Holy Trinity Church in Hartland, are a community of prayer. We are called to worship and praise God, to show his love in all that we do and to reach out to the communities in which we live with the Gospel of Jesus Christ. Our community is for the whole family of God: Children and elders, single and married, divorced and widowed. Click here for the latest images!